Two Inch Cuffs, January 2013. Photos by Ben Lebovitz. Your watch might say it's 10 PM, but at Holeman & Finch, it's burger time. These burgers are so delicious, so famed, and there's only 24 of them. Patrons come in hours ahead of time to put their name on the list and some have experienced the crushing sense of defeat when they discover that they've missed the cut. If you think it's just a gimmick to hype up the restaurant, think again — People who missed out during the week can get them all day on Sunday. So why is this particular burger so tasty? According to co-owner and head bartender, Greg Best, it's a lot like a good drink: quality ingredients crafted with the greatest care. Tell us how Holeman & Finch got started. Holeman & Finch was kind of the brainchild of a drinking session with my now-partners: Linton Hopkins, Gina Hopkins, and Regan Smith. When I moved to this city about nine years ago, I realized this was an amazing market to create a bar in. It was a kind of new, very young scene just starting to take root. My partners at the time were Regan Smith and Andy Minchow. We all worked for Emeril Lagasse. We all moved here to open a restaurant for him and we decided that this is the place to do our own thing. Long story short, we all went to work for independents. I went to work for Linton and Gina Hopkins at Restaurant Eugene and we became close friends. One day, when the landlord here asked Linton to expand his fine dining restaurant, he said, "There's no way I could possibly do that," I piped in with, "Hey I have an idea. Let's open a bar." Holeman & Finch is essentially a bar that was created to be the bar that chefs and bartenders all wanted to drink at after work. We would be remiss if we didn't talk about the famous burger. Can you tell us the story behind it? So when Holeman & Finch opened about four and a half years ago, there wasn't much of a late-night dining scene in Atlanta and we really wanted to draw that service industry crowd in after work. We decided, "Hey, we'll do some fun thing that's kinda off the menu and it'll just be word of mouth" and we decided to do a cheeseburger because who doesn't love a cheeseburger, right? The big thing about the burger is that we decided to really geek out on it. It's not a geeky chef burger with foie gras and pork and bacon; it's just an American cheeseburger. But we took every single facet of it: the bun, the meat grind, the type, how we cooked it, and we basically spent about 3 months of R&D on it before we decided to do this kind of down-low cheeseburger. We only do 24 and the reason being is, in the beginning, there were only 2 shelves available on a baker's rack and each fit one sheet tray of burger buns, so that's how the number started. We never thought in a million years within months there would be a cult phenomenon. Another thing that seems really important to Holeman & Finch is really simple, quality ingredients and crafting them with care. How did that get started and what are your feelings about that? I think too often we get lost in making things more complicated than they need to be, and that's in every walk of life, not just the restaurant business. Our concept was really simple and fundamental: it was to take good things and show them off for what they are, not necessarily who we are. It naturally evolved and took root in our drink program and our food menu. Nothing was meant to be overwrought, but we do care. We genuinely love what we do, so it's how do we share that love with minimal impact to the guest experience and it just became a self-fulfilling prophecy. What would you say to someone who's doubtful of the dining and food scene in Atlanta? I'd say spend two nights in a row going out in Atlanta and you'll realize quickly that we're every bit as exciting and—I would argue—even more dynamic than those other food cities. Because of the nature of this city and how it's laid out, everyone kind of evolves into their own style rather than being on top of each other where everyone borrows from each other and you have this homogenized aesthetic. I love the scene here in Atlanta. I would agree that five years ago, it was very young, very immature. Thanks to a whole bunch of really talented people who were willing to jump, I think this city is, in a big way, now a contender. The origin story behind hot chicken on the restaurant blog is really cool. Do you have any personal food stories that you're really fond of? For me, one of the most instrumental experiences I ever went through was going and spending about 11 months in New Orleans. My love for cocktails really took root there. One thing in particular that I thought was amazing was the idea of the sazerac. It's the official cocktail of the city of New Orleans. It's an amazing, delicious rye drink with bitters and a little bit of absinthe, but what was interesting to me was all these places that celebrated the fact that they make an amazing sazerac, none of them made it the same way. So I thought how brilliant! It just goes to show that cocktails are a philosophy. They're not necessarily a recipe. And so, whenever I'm making sazeracs for people, I love talking about, "Hey, this may not be like the last sazerac you had. This is what I believe to be my personal best sazerac." We can always just get lost down this rabbit hole and make four sazerac variations and it's just a fun way to start dialogue. Because you know drinks really well, what would you recommend that would pair really well with the burger? We have a drink here called The Oracle, which was off one of our early cocktail menus. It's rye whiskey and lime juice, orange bitters, has a little ginger liqueur and jasmine as well. It's bright, it's floral, but it also has a backbone. It cuts right through the fat of the burger but it's also very quenching and refreshing. I think it's one of the ideal pairings for sure. The restaurant is not only a service industry, it's very much a creative industry as well. How do you stay inspired? One of the things my partners and I figured out early on was that it took more than just eating and drinking in other restaurants to get excited. So one of the ways we stay inspired is that we get really involved in local music culture. We know a lot of amazing musicians here in Atlanta. My partner Linton and I just started a radio show called "Feed Radio", which is really exciting. So music is one way and a friend of ours is a graphic artist who's done a lot of creative work with us in the past recently just came to work with us. We have these weekly meetings where we sit down and basically immerse ourselves in fonts or beautiful paintings or different cool, creative graphic art pieces from around the world. It's just a means to constantly stimulate and keep ourselves excited. Tell us a little about the H&F Bottle Shop. So between Restaurant Eugene and here at Holeman & Finch spending about collectively 7 and a half years preaching the good word about these esoteric spirits for all these different styles of cocktails, what I realized was that probably the most important thing about cocktail culture was ensuring that people took it home. Otherwise I think there's the potential for this to be kind of a fad. I think it'll last longer than just a trend, but I wanted to be able to enable people (laughs). I know this sounds horrible. For years people were asking us, "Where can I get this spirit? ", "Where can I get these tools?" and we would be like, "Ah, online maybe." Then we said, "Why are we doing this? Why don't we just open up a bottle shop?" That was the impetus behind H&F Bottle Shop. We're a really cool little boutique, wine and spirits shop. We've got beer as well. We've got bar tools, we've got bar guides. We play old vinyl and just hang out down there. We give out recipe cards when people buy spirits just to help them experiment at home. It's just an extension of what we do. It's a halfway point between peoples' homes and ours. Any words of advice for drinkers? Keep it simple. You should always be willing to try new things and experiment, but always test the level of talent at the bar that you're at. Start with a beer or maybe a straight spirit on the rocks and ask the bartender about it, and if they have some depth of knowledge, maybe strike up a conversation. I'm not saying go out there and tell people, "Hey, can you make me a veiux-carre flip", because unfortunately that's happening with our culture right now. 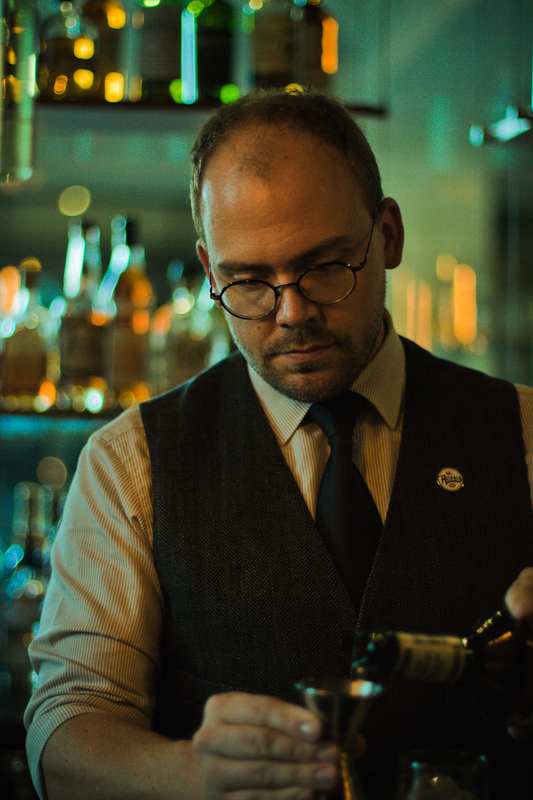 Just really, get to know the bartender and have an open mind. Don't feel like you need to push yourself into drinking things you're not comfortable with because more often than not, you're not ready for it and it'll make for a negative experience and you won't truly appreciate it when you may be able to appreciate that same thing not long down the road. Cakes & Ale in Decatur, Bocado on the Westside, The Optimist, Pura Vida in the Highlands, Leon's Full Service, and Victory Sandwich Bar.